Love your space, lots of wonderful light. I know what you mean about the sun though. Can't wait to see the box once it is altered! I'd love to have a conservatory! Happy creating and enjoy the show! Can't beat good daylight - looks a great place. 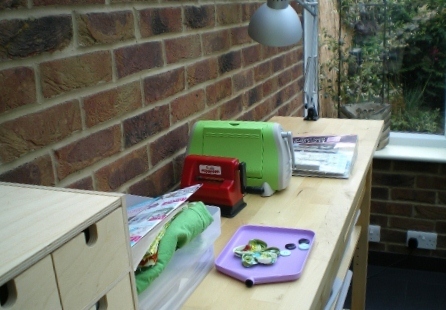 Now being in the conservatory is a great idea to force tidiness! Bet there are days when it's too hot to work out there though. Pretty flower, a brooch is a nice idea. Lovely tidy workspace in such a good position but I could soon mess it up if you want!! LOL! You can't win can you. If you have good light, then it all fades things. If your light is not too good, then you end up with eye strain etc. Thank you for your visit earlier, sorry it has taken so long to get back to you. We have been visiting grandchildren, I am sure you understand.